Emirates, the world’s largest international airline, delivered another year of trendsetting product and service initiatives across its fleet and network to make ‘flying better’ for its customers. In addition, Emirates now offers over 1,000 movies as part of its over 4,000 channel selection on ice, its award-winning in-flight entertainment system. The most popular movie onboard Emirates in 2018 was Black Panther, while the majority of passengers enjoyed comedy of all genres on offer. Emirates was also the first of any airline to launch the classic movie E.T The Extra Terrestrial. Bringing its own content onboard, Emirates introduced a Food & Wine channel to give customers a glimpse into how it creates its menus and sources the best artisanal ingredients and beverages from global partners. Delivering the best culinary experience for customers, Emirates has been building on its already popular special menus and dishes marking occasions including Christmas, Ramadan, Oktoberfest, Lunar New Year, amongst others. In April, the airline upheld its leadership position when it comes to its wine and spirits selection onboard, with a revamp of its spirits offering across all classes, introducing a range of new premium brands as well as exclusive selections. The Emirates Vintage collection, a selection of fine wines that have been stored for 15 years was introduced on select routes in First Class. The exclusive wine selection included Château Cheval Blanc 2004, Château Haut Brion 2004, Château Mouton Rothschild 2001 and Château Margaux 1998. In 2019, Emirates will be exclusively serving the Dom Pérignon Vintage 2008, the next Vintage of Dom Pérignon. 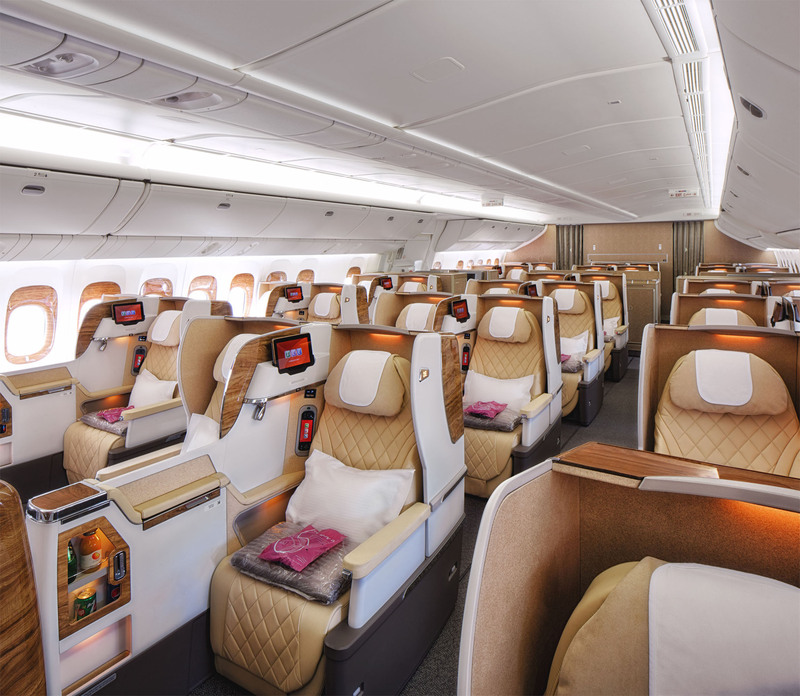 Emirates also brought new luxury products into its First and Business Class offering. The new products were developed from collaborations with BYREDO skincare, Bowers & Wilkins and Emirates’ longstanding partnership with Bulgari for its refreshed amenity kits. The airline regularly refreshes its amenity kits to ensure that customers are able to experience the full range of products onboard. Emirates expanded its lounge network with the opening of new facilities in Cairo taking the total number of dedicated Emirates lounges to 42. The airline also completed the refurbishment of its Rome lounge. Emirates Skywards, the airline’s loyalty programme, hit a milestone 20 million members this year. In 2018, over 14 billion Miles were cashed in for upgrades, reward flights, special Emirates sponsored events, as well as benefits across the more than 172 Skywards network of partners. Flight rewards continue to be the most popular use of miles within the Emirates Skywards programme. In 2018, over 85% of all Miles redeemed were either in the form of an upgrade, a full reward ticket or a cash+miles transaction. This represented more than 1.1 million transactions, which is the equivalent of nearly 6 flight reward transactions for every take off. During the year Emirates Skywards also introduced more attractive rates and a more seamless experience for members to buy, transfer and gift Skywards Miles. In May, Emirates Skywards revamped its ‘My Family’ programme that now enables family members to pool 100% of Skywards Miles earned on Emirates flights, and allows them to redeem rewards faster than before. More than 185,000 ‘My Family’ accounts have been created, and the contribution of Miles from each member can be adjusted at any time. In keeping pace with new technologies, Emirates Skywards now displays relevant ‘always-on’ offers to members booking on emirates.com to help maximise the value of their Skywards Miles. This industry-first feature targets members with personalised upgrade and cash+miles offers based on their loyalty status and travel history when choosing their flights. In August, Emirates Skywards became the frequent flyer programme for flydubai. This alignment allows Emirates Skywards members to earn Skywards Miles and Tier Miles when travelling on both Emirates and flydubai. Providing a world-class customer experience in the online world, Emirates this year introduced immersive 3D seat models on emirates.com, making it the first airline in the world to roll out web virtual reality (VR) technology on its digital platform. Customers can navigate the award-winning 3D seat map of the interior of the Emirates A380 and the Emirates Boeing 777; explore their seats, the spacious cabin and the Emirates onboard product before they select their seats. Emirates expanded its UK footprint with the launch of services to London Stansted and Edinburgh, and enhanced long-haul connectivity to South America with the launch of flights to Santiago de Chile. The airline also launched Dubai-Bali-Auckland services, which has become the only year around non-stop daily flight between Bali and Auckland. Emirates extended its partnership with flydubai to expand access to its customers to a combined network of 206 unique points, and over 1 million passengers have booked their travel on combined Emirates and flydubai itineraries as a result. Since the beginning of December, Emirates customers have direct access to 11 flydubai destinations from Emirates Terminal 3, and both airlines continue to further enhance inter-terminal transfers for customers in Dubai. During the year Emirates also announced a new codeshare agreement with Jetstar Pacific and enhanced its commercial strategic partnership with South African Airways.